By 2007, Rotterdam was facing an educational crisis. Low-income neighborhoods lacked educational resources that could support an expanding immigrant population. Pendrecht—a neighborhood of Rotterdam with a particularly high immigrant population—was named one of 40 areas in the country that faced significant social and economic problems. And while the government had sought to address the issues, a solution was hard to find. Dr. Bowen Paulle was no stranger to communities in crisis. Shortly after earning a master’s degree in sociology, he taught in one of the most notoriously problematic high schools in New York City. His three years teaching in the Bronx showed him first-hand how an underserved school operated. In his 2013 book Toxic Schools comparing high poverty schools in Amsterdam and New York, he details the overwhelming number of obstacles teachers often face on a daily basis—students’ apparent lack of interest, constant absenteeism, lack of order in the classroom, insubordination, and many more woes. As the Dutch government continued addressing educational problems in the mid-2000s, Dr. Paulle became a veteran in the education reform arena. He earned his doctorate in sociology from the University of Amsterdam, in 2005, and worked with policymakers on efforts to desegregate Dutch schools. By 2014, what Dr. Paulle wanted most was to work with an education system that gave him autonomy to run an intensive and potentially scalable tutoring program the way he knew it worked best–in the Saga method. In 2014 Dr. Paulle began doing research on an after-school program for primary school children in Pendrecht (Rotterdam South) for a philanthropic foundation, Distant Mountains (‘Stichting De Verre Bergen’). It was at this point that Paulle proposed the implementation of Saga’s high-dosage tutoring model at four primary schools in Pendrecht. Distant Mountain is supported by a wealthy family looking for original ideas to help strengthen Rotterdam and, for example, the educational experiences of its least advantaged inhabitants. They sought to back ideas other charity groups might deem too risky. Dr. Paulle became the link that bound Distant Mountain with Saga. Distant Mountain bought it on principle alone, and in Fall 2015, asked a local NGO to implement high-dosage tutoring in the Netherlands for at least three years. Using a similar model that Saga uses in its high schools in America, the students were given intensive tutoring four days a week, one hour a day, for the entire school year. Saga was hired as the consulting organization, which meant occasional site visits to the Netherlands by Saga co-founders Alan Safran and Antonio Gutierrez, and a visit by Saga’s data director Cathryn Cook, and regular phone consultations by Alan and Chris Dupuis, Saga’s Chief Academic Officer. Also, Saga welcomed to its Chicago and NY summer training leaders of the Netherlands program. Dr. Paulle was not highly involved with the program at the start, but he kept up with the progress and noticed that the program was being slightly watered down. Dr. Paulle outlined a research project using randomized intervention and control groups. His team ran the randomized control trials. They set their goals high, and according to Dr. Paulle, came up just short of the performance numbers they’d targeted during their first year. But when they pooled the data from the first and second year, they exceeded their goals. It was a sure sign that things were working. Distant Mountain has committed to continuing and gradually scaling up high-dosage tutoring in under-resourced neighborhoods of Rotterdam. The challenges and eventual successes in Rotterdam helped pave the way for The Bridge Learning Interventions, a nonprofit organization set up to implement high-dosage tutoring projects in other parts of the Netherlands. Saga is consulting with The Bridge and Dr. Paulle leads the team at The University of Amsterdam that is studying their interventions. 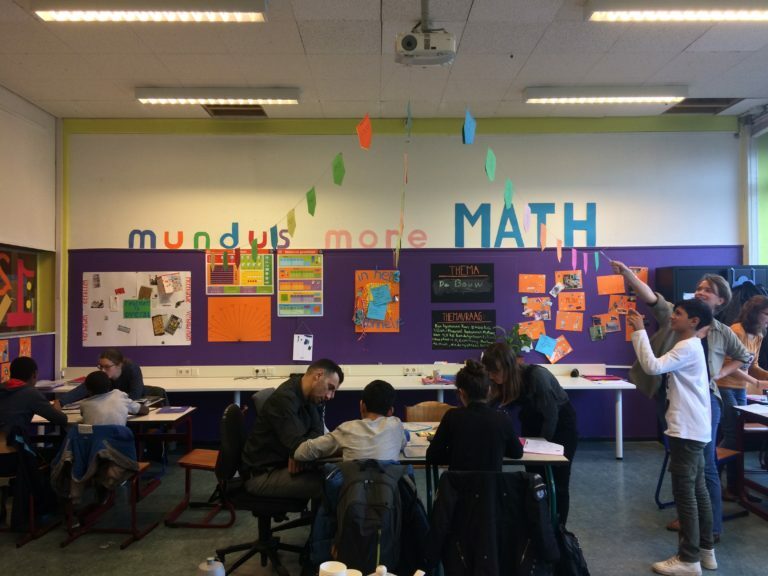 The Bridge’s first high dosage tutoring (HDT) project, known as “Mundus More Math,” was implemented at a high school in Amsterdam serving students who come in, on average, 3 or more years behind in math. The project started in September 2017 and ran for just 5 months. After this relatively short period, the research team found that The Bridge was generating the same types of ‘jaw-dropping’ results that Saga was seeing in their Chicago schools. Thanks in large part to the precision of the research design using randomization (RCT), the results in Amsterdam proved that high-dosage tutoring could work in challenging secondary educational environments across the Netherlands as long as the approach is executed with high fidelity. Dr. Paulle attributes the success in Amsterdam–as well as in Rotterdam, Chicago, and New York–above all to one core Saga principle: strong and durable student/tutor relationships. Soon after the completion of the project in Amsterdam, in February of 2018, The Bridge began a new HDT-project in the city of Haarlem. For at least three years children attending primary schools in Haarlem’s most disadvantaged neighborhoods will receive one hour a day of tutoring for an entire year. If deemed successful, the project in Haarlem will be continued indefinitely. Again, Dr. Paulle is leading the research and Saga is hired as the consulting organization. Alan Safran and Chris Dupuis did an onsite visit and provided coaching to the team in Haarlem (see picture). The Bridge’s successes and the findings of Dr. Paulle’s research team have not gone unnoticed. The Dutch Department of Education has allocated national funds to help assist in the growth of both the implementation and the research. According to Dr. Paulle, this further demonstrates why high-dosage tutoring in the Netherlands may not remain primarily dependent on support from philanthropic organizations in the years ahead–provided the enormous boosts on standardized math tests keep materializing.